Grant Leadbitter's late penalty earned Middlesbrough victory over Bolton in boss Aitor Karanka's Riverside debut. Leadbitter struck eight minutes from time after Tim Ream fouled Dutch striker Marvin Emnes. Bolton had a chance to equalise from the spot themselves but Jermaine Beckford fired over after Andre Moritz had been fouled. Keeper Shay Given helped Boro earn only a third Championship clean sheet of the season on his debut. 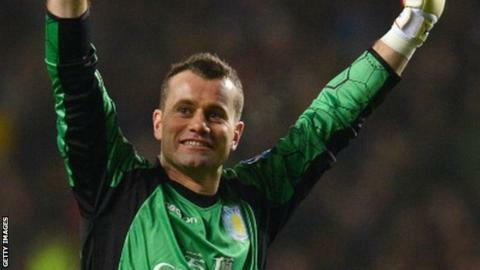 Shay Given's last competitive club appearance was in Aston Villa's 2-1 defeat away to Millwall in the FA Cup last January. The 37-year-old completed a loan move from Aston Villa two days before the game. It was Given's first competitive game since January but the former Republic of Ireland and Manchester City keeper was rarely troubled. He was quick off his line to deny Beckford a chance after ex-Sunderland midfielder Leadbitter had played a dangerous back-pass after the interval. But Boro carved out the better chances and George Friend, Ben Gibson and substitute Curtis Main all went close. The home side won a penalty on 82 minutes as Emnes was hauled down by Ream, allowing Leadbitter to calmly slot home. Bolton could have levelled as they won a penalty of their own when Rhys Williams brought down Andre Moritz two minutes from time. But Beckford blazed high over the bar, much to the relief of recently appointed Boro manager Karanka. "It was very emotional for me. "From the moment I signed the contract I had dreamed of the first home game and the greeting I got from our people made it very special. "But it nearly turned into a nightmare when Bolton won the penalty so late on in the game. We still need to improve." "It stings a bit to concede from a penalty and obviously it stings to miss one too. "But we played well. I think we played well enough if not to win, certainly not to lose the game. "Now it is about how the team react." Match ends, Middlesbrough 1, Bolton Wanderers 0. Second Half ends, Middlesbrough 1, Bolton Wanderers 0. Offside, Bolton Wanderers. André Moritz tries a through ball, but Alex Baptiste is caught offside. Kevin McNaughton (Bolton Wanderers) wins a free kick in the defensive half. Corner, Middlesbrough. Conceded by Jay Spearing. Attempt blocked. Albert Adomah (Middlesbrough) left footed shot from outside the box is blocked. Assisted by Grant Leadbitter. Jermaine Beckford (Bolton Wanderers) is shown the yellow card. (Middlesbrough) wins a free kick in the defensive half. Penalty missed! Bad penalty by Jermaine Beckford (Bolton Wanderers) right footed shot is just a bit too high. Jermaine Beckford should be disappointed. Penalty conceded by Rhys Williams (Middlesbrough) after a foul in the penalty area. Penalty Bolton Wanderers. André Moritz draws a foul in the penalty area. Corner, Bolton Wanderers. Conceded by Grant Leadbitter. Corner, Bolton Wanderers. Conceded by Ben Gibson. Substitution, Middlesbrough. Dean Whitehead replaces Richard Smallwood. Substitution, Bolton Wanderers. David Ngog replaces Lee Chung-Yong. Substitution, Bolton Wanderers. Joe Mason replaces Medo. Goal! Middlesbrough 1, Bolton Wanderers 0. Grant Leadbitter (Middlesbrough) converts the penalty with a right footed shot to the bottom right corner. Penalty Middlesbrough. Marvin Emnes draws a foul in the penalty area. Penalty conceded by Tim Ream (Bolton Wanderers) after a foul in the penalty area. Corner, Middlesbrough. Conceded by Alex Baptiste. Delay in match Matthew Mills (Bolton Wanderers) because of an injury. Attempt saved. André Moritz (Bolton Wanderers) left footed shot from the right side of the box is saved in the centre of the goal. Assisted by Neil Danns. Attempt blocked. Medo (Bolton Wanderers) right footed shot from outside the box is blocked. Assisted by André Moritz. Substitution, Bolton Wanderers. André Moritz replaces Darren Pratley. Attempt missed. Curtis Main (Middlesbrough) left footed shot from outside the box is close, but misses to the left. Assisted by Richard Smallwood. Marvin Emnes (Middlesbrough) wins a free kick in the attacking half. Substitution, Middlesbrough. Marvin Emnes replaces Jacob Butterfield. Medo (Bolton Wanderers) wins a free kick in the defensive half.